The digital era is making its mark on local news. Nearly as many Americans today say they prefer to get their local news online as say they prefer to do so through the television set, according to a new Pew Research Center survey of 34,897 U.S. adults conducted Oct. 15-Nov. 8, 2018, on the Center’s American Trends Panel and Ipsos’s KnowledgePanel. The 41% of Americans who say they prefer getting their local news via TV and the 37% who prefer it online far outpace those who prefer a printed newspaper or the radio (13% and 8%, respectively). Even as the preference for digital delivery creeps up on that for news via TV, local television stations retain a strong hold in the local news ecosystem. They top the list of nine types of local news providers, with 38% of U.S. adults saying they often get news from a local television station. That is followed by 20% who often turn to local radio stations and 17% who rely on local daily newspapers. Next come a range of less traditional sources such as online forums or discussion groups (12%), local organizations such as school groups or churches (8%), and community newsletters or listservs (8%). While individually these less traditional sources garner far smaller audiences than the big three (local TV, daily papers and radio stations), together they add up: 28% of the public often gets news from at least one of the six less traditional providers asked about. The degree to which the public accesses each type of provider digitally versus non-digitally varies a great deal. To start, the vast majority of Americans who get news from local TV stations primarily do so the old-fashioned way: from the television set (76%), not from the stations’ websites or social media accounts (22%). Radio is similarly tied to its traditional form. But most other providers have a substantial share of their audience accessing them online. For example, 43% of daily newspaper consumers tend to get that news digitally, as do 49% of those who rely on community newsletters or listservs. This nationally representative study also reveals that many Americans are not getting local news that is mostly about their own area – a concern raised by many journalism watchers following newsroom cutbacks and media consolidation. About half of U.S. adults (47%) say the local news they get mostly covers an area other than where they live such as a nearby city, while the rest (51%) say it mostly covers their living area. Overall, Americans evaluate their local media fairly positively. Majorities approve of the job their local news providers are doing across seven core job functions, such as covering news thoroughly. And 30% of Americans are very confident that their main news source can get them the information they need, with another 52% saying they are somewhat confident. But the public also has high expectations for their area news providers when it comes to their capacity to be a genuine part of the community. An overwhelming majority of adults say it is at least somewhat important for journalists to understand their community’s history (85%) and to be personally engaged with their local area (81%), and at least four-in-ten deem each very important. When it comes to their own financial support of the industry, just 14% of American adults say they have paid for local news in the past year, either through subscription, donation or membership. When those who don’t pay were asked why, the widespread availability of free content tops the list (49%). Only 10%, on the other hand, said concerns about quality of coverage was the top reason for not paying. Perhaps the most basic function of local journalism is to provide residents with news across a range of topics in a way that helps them live their daily lives and take part in the community. The choice of what topics to cover when and to what degree can be daunting, particularly amid the industry’s ongoing financial struggles. The findings show that Americans have a wide range of topical interests, but most see only a handful of topics as important to their daily lives. Weather, not surprisingly, sits at the top of the list of topics seen as important for day-to-day life, with 70% expressing a daily need for information. That’s followed by crime (44%), traffic (41%) and news about changing prices (37%). Sports, on the other hand, has the largest segment (34%) who find it neither important nor interesting. There is some mismatch between the information news consumers want and the level of ease they have in finding it. News about changing prices, for example, ranks third in the portion of people who find it either important or interesting. But among those who find it at least interesting, it ranks 10th in being very easy to stay informed about. Sports is the opposite. It ranks higher in ease of access than in importance or interest. Traffic and transportation news, on the other hand, ranks about equally in both measures. 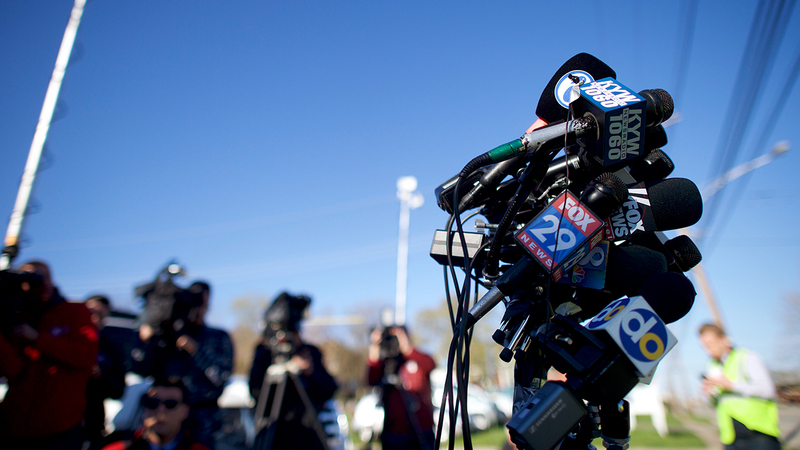 Understanding the local news landscape is complex, as local areas differ in innumerable ways. Some are wealthier, while others contain more families struggling to meet their basic needs. They differ in the racial and ethnic makeup of their residents and the share of locals who are older and retired versus just starting out in life. This study, powered by an unusually large survey sample, finds that experiences with and views about local news vary based on these community characteristics. For example, residents of lower-income areas are more reliant on TV news and less so on digital pathways – though when they do get news digitally they are more likely than those in higher-income areas to use mobile devices. Additionally, individuals living in areas with a higher proportion of blacks or Hispanics are more likely to say daily information on jobs and unemployment is important for their daily life (18% in higher-proportion black areas and 25% in higher-proportion Hispanic areas, compared with 10% in higher-proportion white areas). Finally, individuals living in areas with a younger population are more willing to have journalists express their views on current local issues than those in older-aged areas (41% vs. 31%) – a sentiment also shared by 48% of people in areas with a higher concentration of Hispanics. This study goes even one level deeper, drilling down to the individual local level via a free online, interactive tool. The interactive allows members of the public to search for, examine and download findings about the local news environments of 99 distinct areas across the United States. These areas, defined by the U.S. federal government as core-based statistical areas (or CBSAs), can roughly be described as an urban center and its adjacent counties such as San Antonio-New Braunfels, TX and Minneapolis-St. Paul-Bloomington, MN-WI.1 Four that are highlighted in the report, including the two named here, stand out from U.S. adults overall in their local news habits and attitudes. Residents of the San Antonio area, for example, are more likely than U.S. adults overall to feel the local media are connected to their community, specifically when it comes to the amount of influence they have and whether they cover the area in which respondents live. Most Americans (73%) follow local news at least somewhat closely, but still, about a quarter of U.S. adults (26%) follow local news either not very closely or not at all. Additionally, about four-in-ten (38%) don’t have any type of news provider they rely on regularly for local news, while another 30% rely regularly on just one. Across seven core job functions of local news media, the public clearly places top priority on accuracy. Fully 65% name this as the most or second-most important function. Next, though at much lower rates, come covering stories thoroughly (35%) and dealing fairly with all sides (30%). At the same time, television-oriented local news consumers may have a stronger attachment to local news than those with digital preferences. U.S. adults who prefer getting local news online are less likely to follow local news very closely (21%, compared with 40% among those who prefer TV). Digital local news consumption is being done more through mobile devices than desktop or laptop computers. Roughly half of those who get local news online (51%) primarily do so through a mobile device, about twice that who primarily do so on a desktop/laptop computer (27%); 19% get news on both types of devices equally.